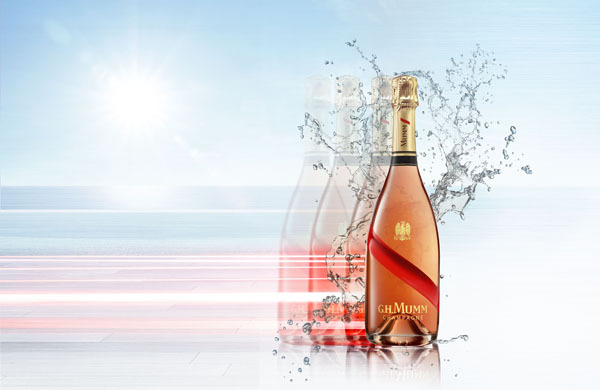 G.H Mumm has just launched their newest cuvée, Grand Cordon Rosé. The champagne, which is displayed in a revolutionary labelless clear bottle, is the perfect choice for embracing sunny days and living in the moment. Cellar master Didier Mariotti selected bold and distinctive Pinot Noir wines from some of Champagne’s most prestigious villages – accounting for 60% of the final blend. The red grape’s strength and personality dominate the fruitiness of Pinot Meunier and the elegance of Chardonnay to create a lively, refreshing wine. Reject tradition by experimenting with food matches involving seafood, charcuterie or even spicy Asian or African tagine dishes to appreciate the full gastronomic potential of Mumm Grand Cordon Rosé. Take it to the next level enjoying a Mumm Grand Cordon Rosé Poptail, the Maison’s cooling and refreshing twist on the champagne cocktail: a handcrafted natural fruit ice pop -peach or raspberry- served in a glass of Mumm Grand Cordon Rosé. Aged two years in the G.H. Mumm cellars in Reims, France, the rosé is a luminous pale salmon pink color, enlivened by shades of orange. Fresh strawberries, cherries, and redcurrants – with a swirling undercurrent of vanilla and caramel. Lively, energetic and perfectly dry in the attack, revealing hints of summer fruits yet with an unexpected arrow of precision running right through to the long savory finish.